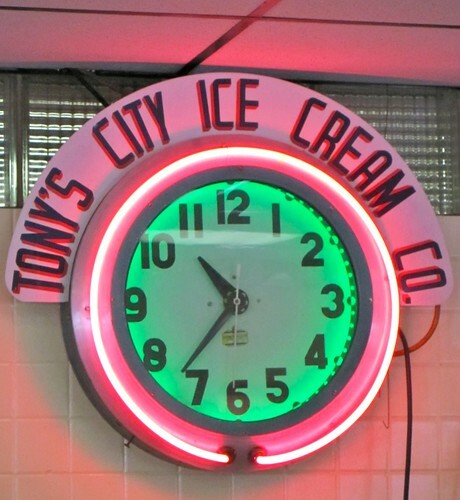 The vintage neon clock on the deco glass brick wall of Tony’s Ice Cream in Gastonia NC clearly showed that it was breakfast time, so we stopped by this family owned and operated business for our first roadfood meal on our retro road trip through North Carolina. 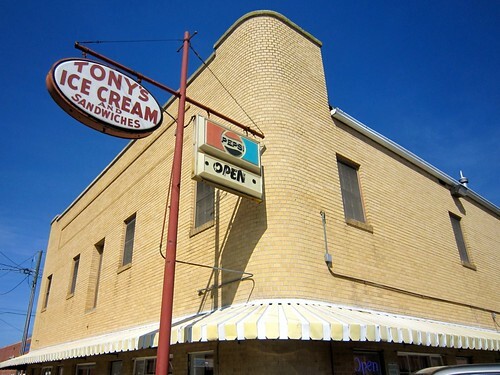 Tony’s has been serving the Gaston County area since 1915, and since 1947 they’ve operated out of this yellow brick building right on the main drag in town. They also make their own ice cream here too, just 20 miles or so outside of Charlotte and a short hop off of 85. We parked in the handy parking lot and entered through the side door to find a line of folks waiting for their breakfast fix. 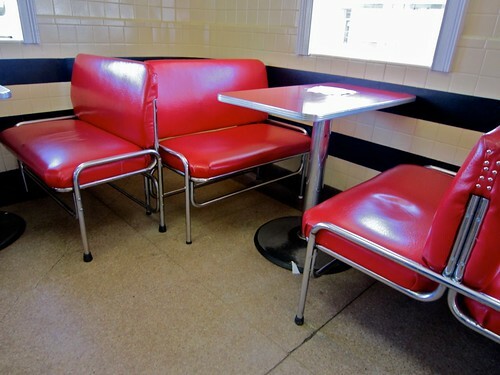 I was immediately taken with the tile walls, well kept chrome & red leatherette booths and Formica tables, many of them filled with families and local folks. We were still getting our sea legs, this being one of our first food stops on our big retro road trip, so we decided to share a standard breakfast sandwich on toast. Looking at the menu now I wish we had thought to get country ham, or a biscuit or something more adventurous, but am relieved that we didn’t get the liver mush! After placing our order (and trying to ignore the looming vintage scale behind us) we waited at the window for our number to be called, and tried not to get in the way of folks coming in the door. 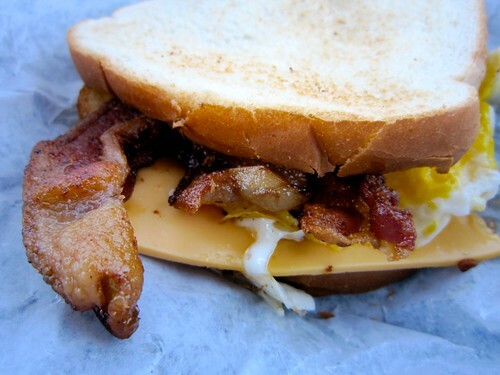 I wanted to grab some photos of the outside of the building so I met RetroRoadhusband out in the car where we unwrapped our delicious amalgam of egg, cheese and the everlovin bacon on white toast. Mmmm look at that piece bacon sticking its tongue out! This was to be one of many meals on the road, and I knew I had a burger in my future, so I graciously allowed RetroRoadhusband to polish off most of this sandwich. Next time we’re going through town I’m definitely getting an ice cream, no matter what time of the day it is! 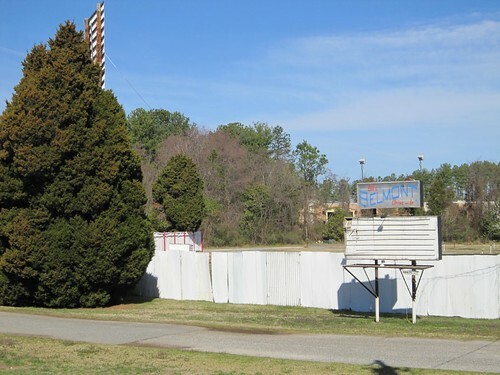 Closed for the season when we drove by on a Saturday morning, Bill’s Belmont Drive In in Belmont NC has been providing the greater Charlotte area with that classic summer drive in movie experience for over 50 years. With room for almost 300 cars, they offer two first run shows, full service snack bar and Dolby surround sound at the bargain price of $4 per person. 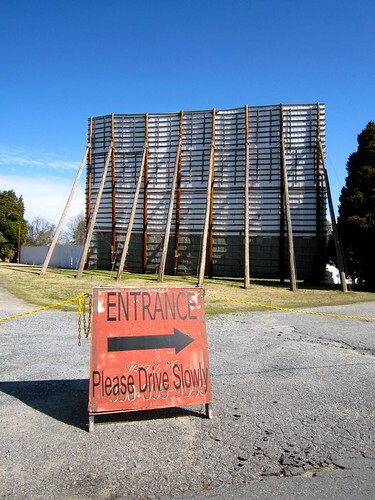 The Belmont is one of only 6 drive in movie theaters in North Carolina, so if you’re in the area and have a hankerin to see a film under the stars, visit the Belmont! 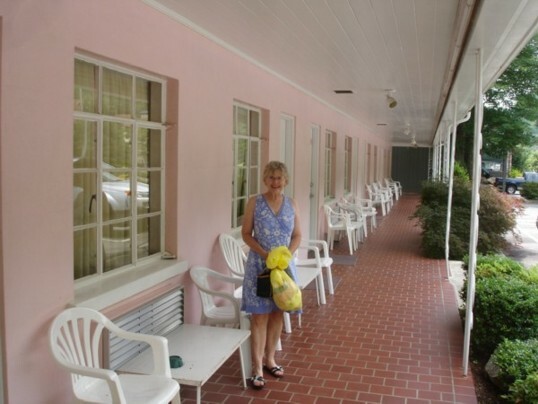 Alas this is the final entry from our all too short stay in the south. I would not have been able to cover as many cool places in such a short amount of time if it wasn’t for the “insider skinny” provided by local folks Pat at Charlotte Eats ,Matt Brunson of Creative Loafing and his pal Annie. Thanks and I hope to return the favor if “y’all” are ever in PA! 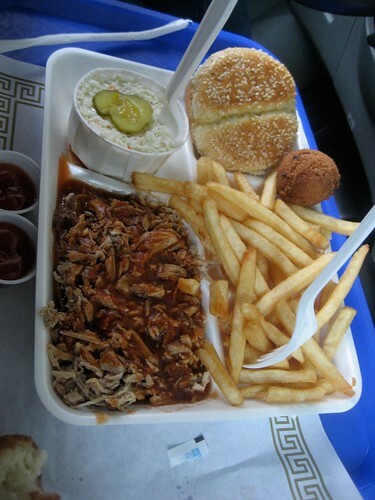 When you try and cram too many meals into too few hours, you end up doing wacky things, like eating barbeque in your car at 10:30am on a rainy Saturday at the Bar B Q King in Charlotte NC! 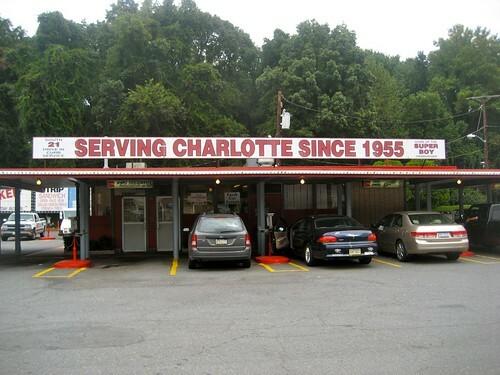 Serving Charlotte since 1959, this place is a great roadside drive in with speaker service and trays that pull right up to the side of your car. Our eating schedule got all thrown off during our incredibly short stay in Charlotte, having discovered the South 21 and also discovering that many of the BBQ places we thought we might try closed very early. So it was delicious cajun food at the Cajun Queen for dinner (thumbs up!) 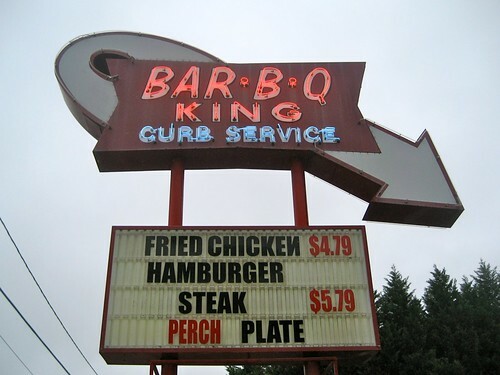 and then an early visit to the Bar B Q King as we were driving up to Baltimore. Luckily the food, sign and service was worth the detour! 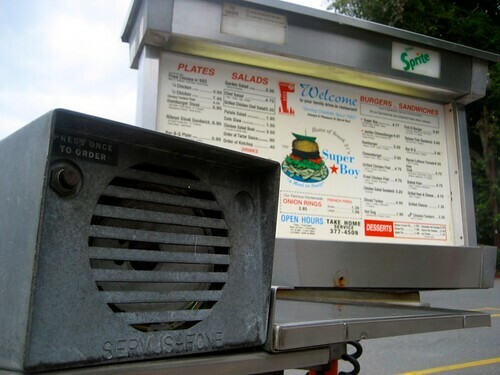 We felt like old pro’s pulling up to the Serv Us Phone and ordering from our car (no indoor seating at the King) just like at South 21. 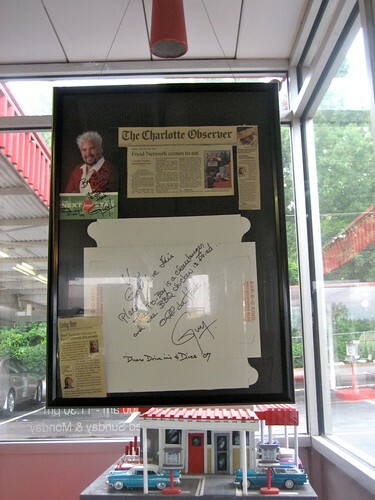 We were the only folks there at this early hour, so as I roamed about taking some photos and dodging the raindrops, one of the kind gentlemen who worked there invited me inside to see one of their crowning glories- an autographed display from Guy Fiore of “Diners, Drive Ins and Dives” TV show. Our Bar B Q came out hot and fresh, with a tangy sauce and sides of hush puppies (one was scarfed down before I could even snap a photo!) 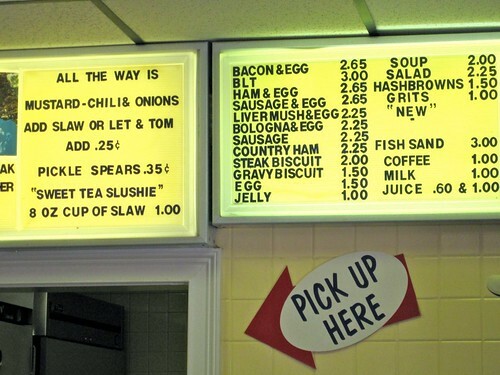 And though there’s no pick, you can see the Charlotte Pickle on the cole slaw. I’ll be honest and say that the sauce was quite tangy, as I’ve been told North Carolina BBQ is supposed to be, but I’m not sure if it’s supposed to be as tangy as we had it. Locals care to chime in? 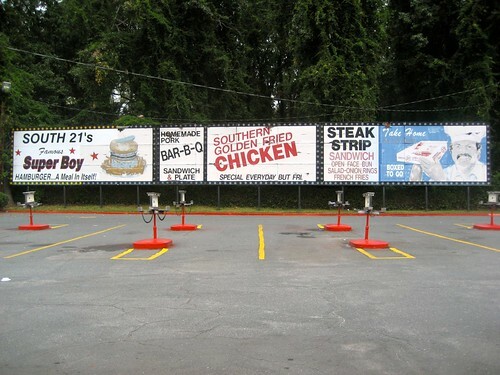 I know everyone in NC has an opinion as to who has the best ‘cue, and I’d be more than happy to go back down there and sample some. 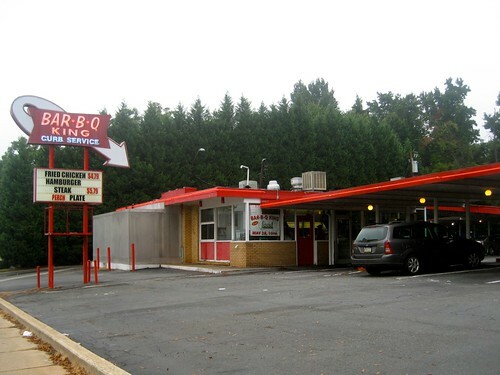 But for a quick bite on the way home, the Bar B Q King fit the Retro Roadmap bill! 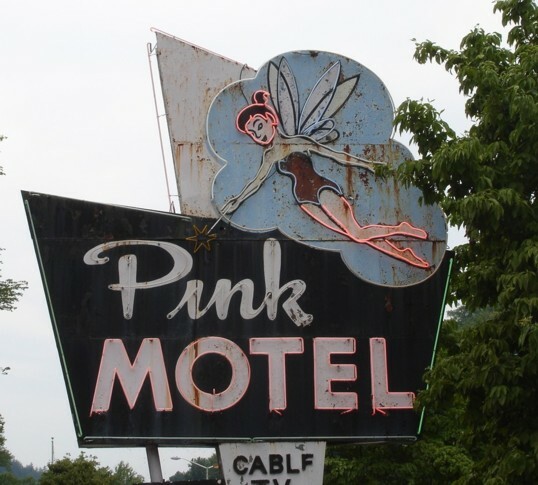 We were en route from one side of Charlotte NC to the other when I saw this sign coming up on the side of the road. We couldn’t pull to the right in time to get into the parking lot on the first try, but it was worth it to do the cloverleaf move so we could check out the South 21 Drive In on E. Independence Blvd. As you can see it’s been luring drivers off the busy road since 1955, and you can add us to the list. 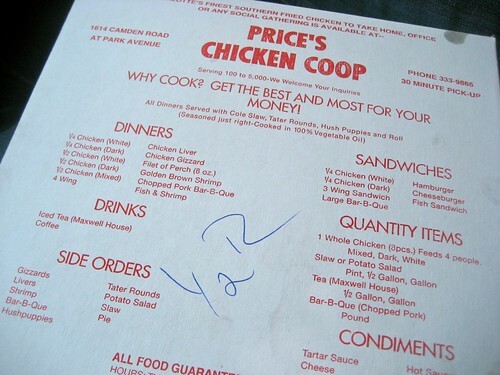 Even though we had just eaten our fill (and then some) at Price’s Chicken Coop not a few hours earlier, we knew we had to pull into a parking space stall and order something from the squawk box attached to the menu. 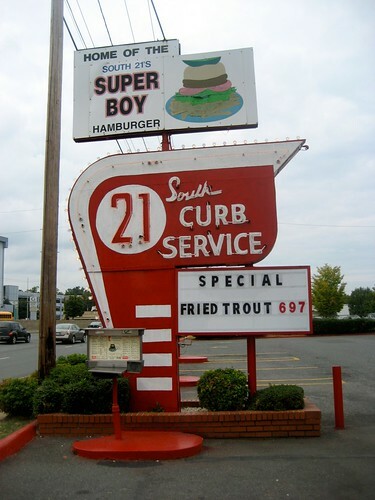 Following the suggestion of the big sign near the road – and the sign above the stalls – and the big ad in the middle of the menu – we got a famous Super Boy burger (to split) – two beef patties, mustard, onions, lettuce, tomatoes and french fries. Ketchup, as you can see- is by request. Delivered by a friendly gent in a red shirt and black hat, we somehow managed to polish off our tasty burger with little complaint. Family owned and operated since 1955, there are a couple of other South 21’s in the area, but this is the only one with the car hop / curb service and great vintage signage. Fried chicken seems to be a special on Fridays. 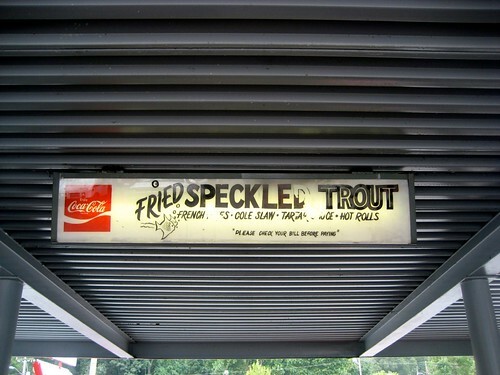 And if we were to go there again (which we will when we’re back in the area, for sure) I definitely want to try the trout. 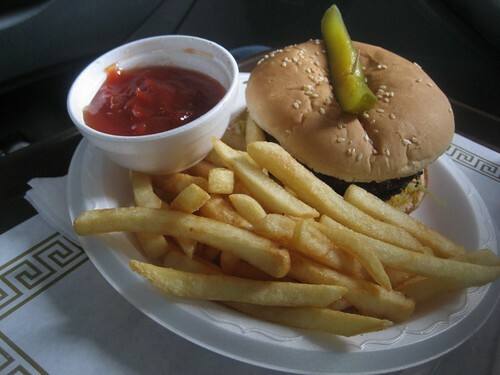 Kitschily named the “Fish-O-Burger” it is another local fave. John W. Lennon so aptly noticed that “life is what happens when you make other plans” and while we didn’t plan on stopping at the South 21, it is a welcomed addition to the North Carolina Retro Roadmap! 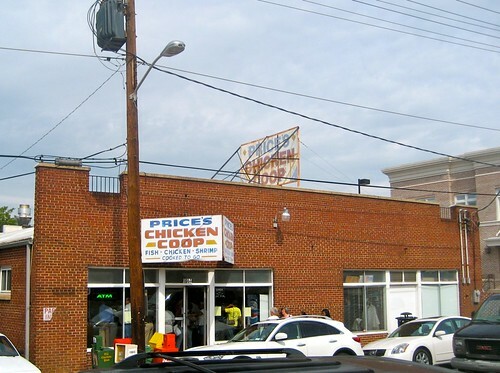 Price’s Chicken Coop Charlotte, NC – Fried Chicken Heaven! So you, my dear Retro Roadmap Reader will be prepared like a local, let me clue you into what Price’s Chicken Coop Is and Is Not. *Is the most tasty fried chicken I have ever had- the skin was fried to a crispy perfect goodness and the meat was moist and flavorful. 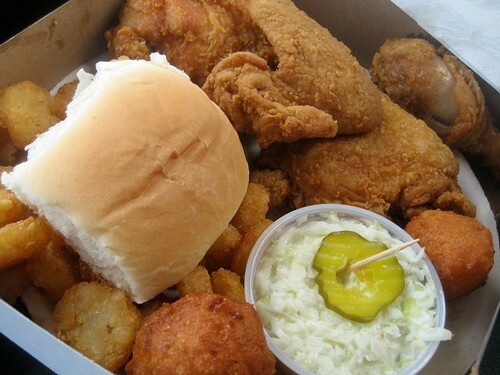 *Is a total bargain- we ordered a 1/2 chicken meal that came with 4 pieces of chicken, 2 hushpuppies, a roll, tons of tater rounds and a container of cole slaw with that Charlotte oddity “pickle on a toothpick” garnish (toothpickle?) and 2 sweet teas- it came to around $12 and we had so much food left over! -Is Not an orderly place – just jump into one of the many lines and be ready to order! Now onto the good stuff- drum roll, please! As you can see by the leg with a bite out of it in the corner it was hard to restrain ourselves for the seconds it took to snap a photo. Looking at this photo I now realize why the scale was tipped so heavily after our return, and why I’m salivating right now!